The Stag street hockeyball 1800-30 has a weight of 60 gram and a diameter of 68.5 millimeter. This is slightly more than street hockeyball from Mylec (65mm in diameter and 55g weight) as indicated by the SPL Technical Committee. Send Rouge back to Aldebaran for maintenance. According to the documentation, cross-compilation is only possible from linux with the script extern/utils/cross-compil.env.sh. Yet, the documentation is wrong, the script can be found in tools/crosscompile.sh (both version 1.3.8 and 1.3.13). After booting, the bhuman stick has only two ports open. When bhuman is started, one tcp-port and a number of udp-ports are opened. Tried to run my helloworld again. helloworld.exe -pip 192.168.0.80 -b 192.168.0.80 failed on SOAP-ENV. On the bhuman-memorystick, you have the file /opt/naoqi/lib/autoload.ini. This file contains three modules alcore, devicecommunicationmanager, bhuman. The Aldebaran-stick also has core-modules launcher, framemanager and extra-modules like sensors, motion, leds, pythonbridge, albonjour. launcher allows to load dynamically other libraries (such as helloworld). albonjour seems necessary for telepathe. Could still not load dynamically helloworld. Could connect with telepathe, although camera complains that ALVideoDevice module is not running. Could connect with memory, and display the allauncher string 'autoload.ini loaded'. Added videoinput to extra-modules. Now Telepathe 1.3.17 connects but hangs. Telepathe 1.3.13 has a nice console window with debug-information. 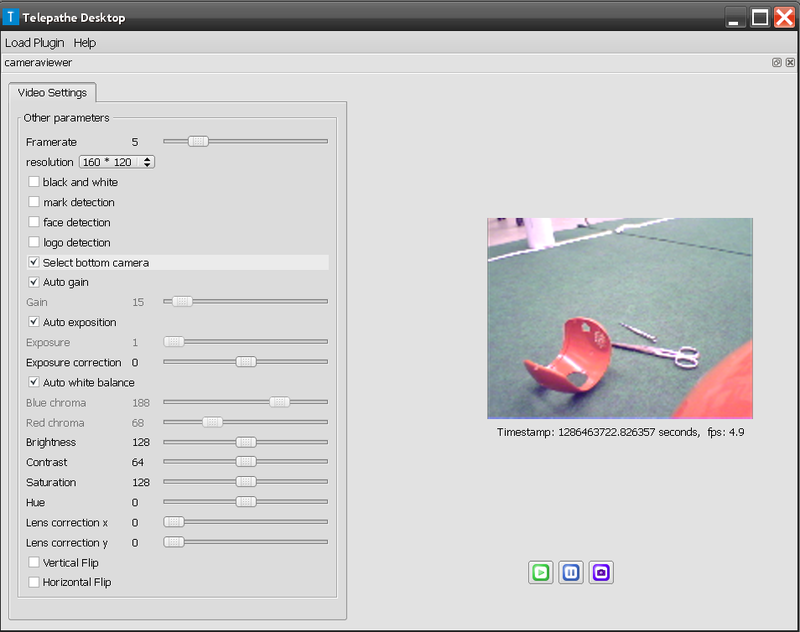 Still, Telepathe works for memory (BodyVersion V3Plus), but hangs with camera. When the bhuman module is not autoloaded, Telepath 1.3.13 can access both camera's with 4.9 fps. /etc/init.d/lighttpd start starts the webserver. The configure script can be found in /srv/www/cgi-bin/protect. Tried to set time of Nao correct. Downloaded certificate, did dos2unix on faro, and stored it in /etc/wpa_supplicant/certificates. Stopped wifi via webinterface, and restarted with command wpa_supplicant -Dwext -i wlan0 -c/etc/wpa_supplicant.conf. Unfortunatelly, after CTRL-EVENT-EAP-METHOD EAP vendor 0 method 21 (TTLS) selected, I get a segmentation fault. The wpa_supplicant seems modern enough (v 0.6.9), while the documentation indicates v 0.6.0. Connection via vislab (Open/No Auth) works (192.168.1.*). Reset time. Finally living in 2009. For cross compilation, the cross compilation toolchain has to be downloaded from aldebaran. CMake Error: The source directory "/home/arnoud/packages/NaoQiAcademics-1.3.13-Linux" does not appear to contain CMakeLists.txt. Installed NaoQi version 1.3.8 on u013153. Could connect Telepath 1.3.8 with Rouge running 1.3.17. Select View Devices. Looked at the ChestButtonValue. Activate both the watch and the graph. Subscribed Ever 100 ms. Started graph. Saw me touching the ChestButton. Download \etc\network\interfaces, \etc\hostname and \etc\wpa_supplicant.conf. Put a copy of this files in D:\Programs\Aldebaran\NaoQiAcademicsvc80-1.3.8-win32\tools\. Replacing the head is quite easy, just touch the two buttons on the neck. Unfortunatelly, when rebooting with the new head, the eyes lighted up all colors, but at the end the boot failed and the robot was dead. The robot did not react anymore on the chest button. Replaced the laser head for the original head. Still no reaction on the chest button. Switching the battery (as suggested by the forum) didn't help. Maybe next time I should remove the battery before switching elements. Downloaded drivers and sample programs from hokuyo-page. They have also inspection programs for Windows and Linux. The laser scanner doesn't get its power from USB, it needs 5 Volts on its RS 232. Bleu has to go back to France for maintenance. Recorded movie of favorite dance. Initiated DNT-directory on our svn-server. First created directory. Right click -> Create repository here. It seems that first a import has to be done before the repository is usable. svn complains that the repository is created with a different svn-version. On this machine there are two svnservers (one in cygwin\bin and one in C:\Program Files\CollabNet Subversion Servr. Created a repository with cygwin (version 1.6.5). Still complaints about version difference. Installed TortoiseClient (version 1.6.5). After checking the correct spelling of Blue, phase2 of the install was finished. Also installed Ext2 File System Driver on u152. Installed mkisofs package inside cygwin. Aldebaran provided the version 1.3.13 image on their site, so I didn't have to try mkisofs -r /cygdrive/h > opennao-academics-1.3.13-nao-geode.ext3. Executed succesfully HelloWorld. Only one warning (thread delay too big). This due to the strange time set on the Nao (things that it is already 2010). Didn't work yesterday, because cygwin's python was called, instead of window's python. Started the HelloWorld service on Rouge with command helloworld.exe -pip 192.168.0.22. Unfortunatelly, configureClient: sendBackIP returns 192.168.0.54 (u154) instead of 192.168.0.22 (Rouge). ConfigureClient is part of ALNetwork. Tried helloworld.exe -pip 192.168.0.22 -b 192.168.0.22. This gives a soap-bind error in modules\src\network\src\alnetwork.cpp. Continued with library. Including the release version goes well. Started with debug version, which fails on an assertion (I think because of the 26 warnings about missing pdb's). Release compiles without warnings :-). Nicely a log is created in D:\tmp\. This concludes the compilation example. There are two other examples (getandset.exe and motionexamples.exe). Not directly clear where those are located in the manual. The programming section describes the genericvideomodule. Performed both test in motionexamples. Use testMotion_CurrentConfig.py to specify the robot to use (Choregraphe or Rouge). test_ALSetComExamples should be only used on Choregraphe, testMotion_CurrentConfig.py can be used on Rouge. Rough check indicates that the Nao can only be used for half a chess-field. Two Nao's could possibly cover a field. Another problem are gripping the chesspieces. The three fingers do not allow to grip from above (the middle finger pushes the piece through the other two fingers). Gripping from the side is only possible when there are no pieces around. Did favorite dance with Blue, but also here the Nao falls to its side. Flashed opennao-academics-1.3.17.3-nao-geode.ext3. 119+1 records, 499,974,144 bytes written. Next to \etc\network\interfaces, also \etc\hostname should be set to Rouge and the ssid should be set to robolab in \etc\wpa_supplicant.conf. Put a copy of this files in tools\Rouge. With rev. 1.3.17 the favorite dance succeeded (once). Continued with the compiling instructions of the HelloWorld sample. Installed CMake 2.6 and LibUSB 0.1.12.2 at u154. Created environment variable AL_DIR and include D:\packages\pthread.2\lib to PATH. Executing both naoqi.exe and helloworld.exe succeeds this time. Now test_mymodule.py fails on extern/python/aldebaran/naoqi.py: No module named inaoqi. Maastricht has bought 4 Nao's, and has a wiki-page. Installed Choregraphe 1.3.17 on 192.168.0.54. Program complains that real robot has stick with version 1.3.13. Behavior is still OK.
Did HelloWithLeds, while sitting (and putting enslave on). Leds still give problem when connected to local Nao. Downloaded Geode Cross compilation. According to manual, I need a ISO image. This image is not on the forum, but also in the downloads: OS image v1.3.17. According to the documentation, I should first install NaoQi before I can flash the disk. Found out that Dr. Dragan Bosnacki from the TU Eindhoven also has a Nao academics account. First installed Telepathe-1.3.17. Also worked without problems with 1.3.13 stick. No time to install NaoQi. There is a newer version (1.3.17) available for Choregraphe, Telepathe and NaoQi. Release notes didn't indicate that this would solve any of my problems. Started DHCP for robolab-lan. Nao needs a restart to connect to router. Was able to get to configuration-interface of Nao, but failed to start Wireless connection (needs hex-key?). Was able to connect in Choregraphe to real Nao, but this Nao didn't dance. Sensor-bug didn't occur when connected to real Nao, although it was still present when connected to simulated Nao. Responsable for the robot laboratory in Maastricht are Nico Roos and Steven de Jong. Ben Torben-Nielsen has now post-doc in Japan. Giving a hex-key solved this wireless issue. Also the wireless connections now get an automatic ip-number. Problem with this setting is that the wired connection gets priority on the wireless connection, and the wired connection doesn't have internet. Unfortunatelly, the /etc/network/interfaces of Rouge is corrupted. Had to swap the USB-stick to get it working again. The USB-stick is a Kingmax Super Stick, which can be read by any USB-port. Unfortunatelly, the file-format is ext3, so Windows asks cannot read the file. Maybe Ext2 IFS or linux-reader can solve this. Wikipedia recommanded Ext2 File System Driver. Configured the software to give write permission on ext2-disks. Started service manually by Tools->Service management. Also configured File->Install Ext2Mgr as service, which should work after reboot. Could read /etc/network/interfaces, but didn't try to save it (corrected the file already with linux-laptop). Installed Choregraphe. Skipped Bonjour. Flow-diagram tutorial works, except for sensor interface. Can be due to Bonjour, or Python installed on the D:-drive. After installing NaoQI, I think that Choregraphe needs the Environment Variable AL_DIR. No, still the same problem. Try again with real Nao. Set AL_DIR to D:\Programs\Aldebaran\NaoQiAcademicsvc80-1.3.13-win32. Continue with the HelloWorld sample. The second step didn't work, maybe because Bonjour wasn't there. Quite complicated HelloWorld (three executables for one task). python was not in the PATH. Further, check for LD_LIBRARY_PATH and PYTHONPATH. Downloaded Bonjour1.0.6. bin\naoqi.exe starts now correctly on ip-adress 0.0.0.0. python test_module.py 0.0.0.0 still fails with 'failed to get MyModule'. modules\bin\helloworld.exe complaints about 'system cannot execute the specified program'. Should this module be started from a module starter? Ook met ZERO_CHECK als startup project helloworld fails.